Every now and then, during my morning shower, my befuddled mind can’t remember whether or not I’ve shampooed my hair. I stand there looking confused, deciding whether or not to risk doing it again (which seems like a waste of time), or risk not doing it at all. I suspect that there are other (far more important) things in life that we should be doing, but we’re not sure if we already have. So, if you’re not sure whether or not you’ve told your spouse and kids that you love them and are proud of them, play it safe and do it again. If you have any doubt about whether you’ve told your staff that they’re doing a good job, be 100% certain and tell them again. If you’re not sure if you’ve done just 2 or the prescribed 3 sets of exercises, do another one just to make sure. If you can’t remember whether or not you’ve learned something or moved closer to your goals today, do something extra just in case. And if you’ve forgotten whether or not you’re prayed today, it’s better to pray twice than not at all. 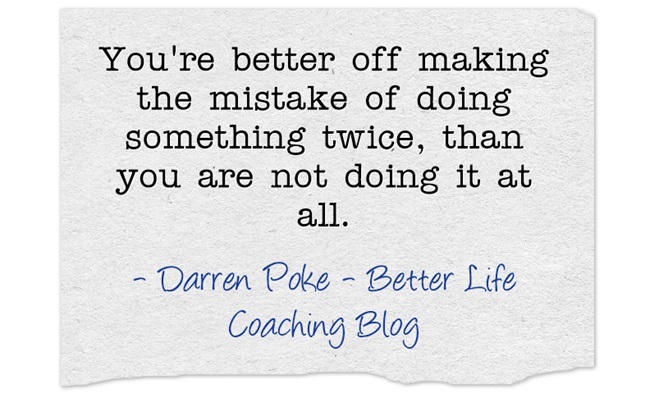 Because you’re better off making the mistake of doing something worthwhile twice, than you are not doing it at all. I really love this one! Thanks!